It's 2017 and anything goes, I guess. You might recall that, recently, the genius clothiers at Topshop introduced a trend that divided the nation. "Clear Knee Mom Jeans" were met with mixed reviews and certainly had their 15 minutes of fame. Well, today, it seems as if the British retailers are back at it. Indeed, a new trend appears to be coming for "Clear Knee Mom Jeans'" limelight. 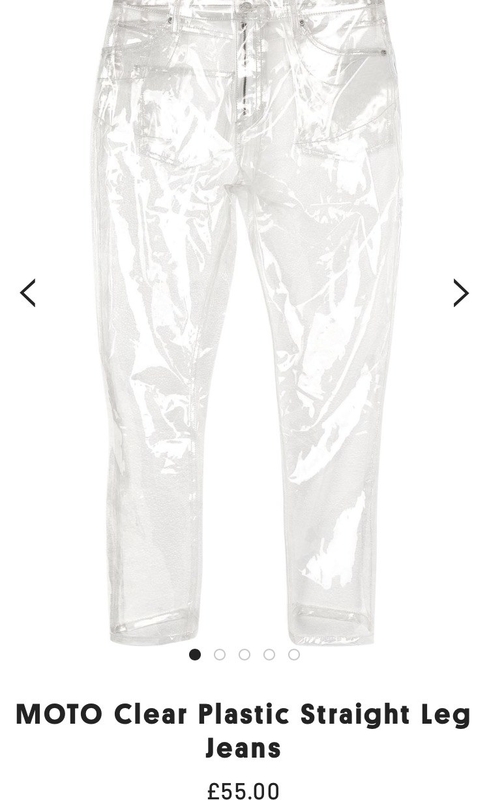 Ladies and gentleman, I give you Topshop's MOTO Clear Plastic Straight Leg Jeans. No need to check your eyesight, folks, you read that correctly: These are jeans that are made of plastic. Of course, people are airing their feelings about these avant-garde wonders of fashion, saying things like "Um what?" and "delete this." Others, still, are praising the brand's ingenuity. Meanwhile, some are just outright confused, or have taken to stating the obvious: These things have to be a sweaty hotbox for anyone wearing them. 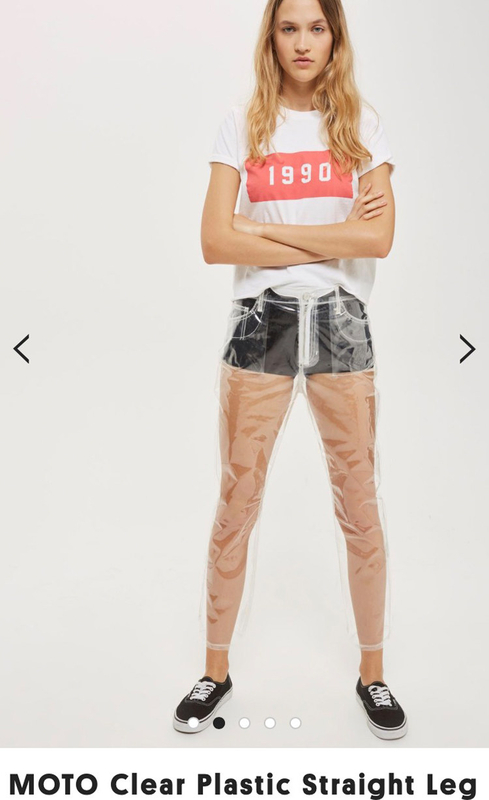 @roadrunner1904 @Topshop @planetjedward I know....clear...plastic...allegedly jeans. Sweat City! I mean, they might actually work well with these Yeezy boots if you ask me. But, the most important responses are those that echo the primary thought I've had since I started writing this: ARE THESE ACTUALLY JEANS IF THEY'RE MADE OF FOOKIN' SARAN WRAP?? What do you think? Are these plastic pants jeans? YES, this is ~fashun,~ these are JEANS, don't @ me!!!!!!!! Topshop has gone too far!!!!!! These are NOT JEANS, I MEAN IT THIS TIME!